Mr. Chairman, ladies and gentlemen, it is an honor to receive from the American Society of Pharmacology and Experimental Therapeutics the 1996 Otto Krayer Award sponsored by Zeneca Pharmaceutics Co. I am especially delighted to receive this award not only because of the remarkable contributions that Prof. Krayer gave to Pharmacology, particularly his studies on the hypotensive alkaloids from veratrum, but far more important, because of the superior moral and ethical principles he demonstrated by refusing to accept the position of Professor and Head of Pharmacology at Düsseldorf University after Philip Ellinger had been removed by the Nazi government. I quote, “More important perhaps for the history of the time was Krayer’s unparalleled audacity in 1933 when he wrote a letter to the all-powerful Prussian Minister of Education in which he explained why he felt unable to accept the chair of pharmacology at Düsseldorf from which the Jewish incumbent, Philip Ellinger, had just been removed: ‘…the primary reason for my reluctance is that I feel the exclusion of Jewish scientists to be an injustice, the necessity of which I cannot understand, since it has been justified by reasons that lie outside the domain of science. This feeling of injustice is an ethical phenomenon. It is innate to the structure of my personality, and not something imposed from the outside. Under these circumstances, assuming the position would make it difficult to take up my duties as teacher with joy and a sense of dedication, without which I cannot teach properly… The work to which I have heretofore dedicated all my strength, means so much to me that I could not compromise it with the least bit of dishonesty. I therefore prefer to forego this appointment, rather than having to betray my convictions; or that by remaining silent I would encourage an opinion about me that does not correspond with the facts.’ Prof. Krayer was summarily dismissed and informed that all German Universities henceforth were ‘off-limits’ for him. In 1937 he joined the Faculty of Harvard Medical School as Associate Professor of Pharmacology and two years later succeeded Reid Hunt (1870–1948) as Head of the Department.” (Witkop, 1995). This lecture, delivered in March 1996 during the Annual Meeting of the American Society of Pharmacology and Experimental Therapeutics, brings together many published and some unpublished findings from our laboratories on the properties of neuronal nAChRs in the mammalian CNS that have led the way to a better understanding of the nAChR function in the brain. Neuronal nAChR subtypes in the CNS are extremely diverse in their kinetics of activation and inactivation and in their sensitivity to nicotinic agonists and antagonists (Sargent, 1993; Lindstrom, 1995;Role and Berg, 1996; Albuquerque et al., 1995a,b;Albuquerque et al., 1996). This diversity, which may provide the basis by which several physiological actions can be triggered by a single neurotransmitter, is a consequence of the various subunit compositions of these receptors that can be heterooligomers formed by combinations of agonist-binding α subunits (α2–α9) with structural β subunits (β2–β4), or homoligomers formed by the α7, α8 or α9 subunit. Numerous studies in expression systems such as oocytes, fibroblasts, COS and HEK cells have dealt with the characterization of the possible functional receptors formed solely by α subunits or by combinations of α and β subunits (Bertrandet al., 1992; Séguéla et al., 1993;Elgoyhen et al., 1994; Gerzanich et al., 1994;Peng et al., 1994; Briggs et al., 1995). However, it was not until recently that clues were provided about the possible physiological roles of the various neuronal nAChR subtypes in the brain. One of the major problems in addressing nAChR function in the brain has been the lack of specific agonists and antagonists for each of the receptor subtypes (for a review, see Albuquerque et al., 1995a,b). This problem was aggravated by the fast kinetics of inactivation of some neuronal nAChRs, particularly those composed of the α7 subunit. The field has now advanced immensely, and many of these problems have been overcome. In this lecture, studies from our laboratories will be presented chronologically from the initial characterization of the diverse subtypes of native nAChRs in the CNS to the identification of the physiological functions of some of these receptor subtypes, including the description of the receptor distribution on the surface of neurons. It is generally acknowledged that the hippocampus, an area of the CNS that is involved in processing cognitive functions (Petit, 1988), is very sensitive to cholinergic modulation, and that the density of neuronal nAChRs in the hippocampus is severely diminished in diseases characterized by learning and memory impairment (e.g., Alzheimer’s disease) (Maelicke and Albuquerque, 1996). Actually, it is fair to say, “The hippocampus’s main input is in providing a keen memory of context, vital for emotional meaning; it is the hippocampus that recognizes the differing significance of, say, a bear in the zoo versus one in your backyard” (Goleman, 1995). Thus, the developing hippocampus has become the focus of our interest with regard to characterization of the nAChR function; and electrophysiological techniques, particularly the patch-clamp technique, have been remarkably important for the studies of the functional and pharmacological properties of nAChRs expressed in single neurons. Hippocampal neurons in culture respond to nicotinic agonists with one of three types of nicotinic whole-cell currents, named type IA, type II and type III, which are distinguished from one another on the basis of their kinetic and pharmacological properties (fig. 1;Alkondon and Albuquerque, 1993). Type IA currents, by far the predominant response of hippocampal neurons to nicotinic agonists, are fast-desensitizing currents that show a rundown that is associated with intracellular high-energy phosphate compounds and an intracellular Mg++-dependent inward rectification (fig. 1; Alkondon and Albuquerque, 1993; Alkondon et al., 1994; Castro and Albuquerque, 1995). The fast kinetics of inactivation and the short-lived open time of the nAChR channels that subserve type IA currents account for the unique kinetic properties of these currents (Castro and Albuquerque, 1993). Further, type IA currents have a high sensitivity to blockade by α-BGT, MLA, α-CTx-ImI and α-cobratoxin (fig. 1) (Alkondon et al., 1992; Alkondon and Albuquerque, 1990, 1991, 1993; Pereira et al., 1996). Pharmacological and kinetic properties of nicotinic currents recorded from hippocampal neurons. Top row illustrates the typical family of whole-cell currents (type IA, type II and type III) evoked by application of ACh to hippocampal neurons and their sensitivity to blockade by nicotinic antagonists. Short pulses (1–2 sec) of ACh (3 mM) were applied via a U-tube to hippocampal neurons at the time indicated by downward arrows. Antagonists were applied via bath superfusion and as an admixture with ACh. Holding potential = −56 mV. Middle row depicts the rundown with time of peak amplitude of type IA currents and its prevention by the use of an ATP-regenerating internal solution [see Alkondon et al. (1994) for detailed solution compositions]. Graph on the right illustrates that, in contrast to type IA currents, type II currents do not run down. Bottom row displays the current-voltage plots of type IA (left) and type II currents (right). Type IA currents only showed inward rectification when MgCl2 was added to the internal recording solution, whereas type II currents showed inward rectification even in the absence of added Mg++ in the pipette solution. In contrast to type IA currents, type II and III currents, which desensitize very slowly, can be recorded from a small population of the hippocampal neurons (Alkondon and Albuquerque, 1993, 1995). Also in contrast to type IA currents, type II currents show an inward rectification that is independent of intracellular Mg++ and do not run down (fig. 1) (Alkondon et al., 1994). Approximately 10% of the hippocampal neurons in culture respond to nicotinic agonists with type II currents, whereas no more than 2% of the neurons in culture respond to the agonists with type III currents. Type II and III currents are differentiated from one another on the basis of their sensitivity to nicotinic antagonists. Activation of type II currents is inhibited by DHβE (10 nM), and activation of type III currents is inhibited by mecamylamine (1 μM) (fig. 1). A comparison of the kinetic and pharmacological properties of the nicotinic currents evoked in hippocampal neurons to those of currents elicited in oocytes ectopically expressing distinct subtypes of functional nAChRs led to the suggestions that an α7-bearing nAChR subserves type IA currents, an α4β2 nAChR subserves type II currents and an α3β4 nAChR subserves type III currents. These suggestions were supported not only by the finding of mRNAs coding for α7, α4 and β2 subunits in hippocampal neurons, but also by the proportion of cultured hippocampal neurons that bind [125I]α-BGT (a probe to label α-BGT-sensitive neuronal nAChRs) or [3H]nicotine (a probe that labels the high-affinity, presumably α4β2 neuronal nAChRs) (Alkondon et al., 1994; Barrantes et al., 1995). Analysis of the stoichiometry of some neuronal nAChRs have indicated that, similarly to muscle nAChRs, those receptors are pentameric and composed of two α subunits and three β subunits (Cooper et al., 1991). However, there is evidence that some neuronal nAChRs may be composed of as many as three different subunits (Vernalliset al., 1993), and that some subunits (α7, α8 or α9) are capable of forming homomeric nAChRs that are functional when heterologously expressed in systems such as oocytes or fibroblasts [for a review see Lindstrom (1995)]. Thus, one cannot conclude by analogy that all neuronal nAChRs will necessarily have two agonist-binding α subunits and three structural β subunits. It is also difficult to conclude on a comparative basis that native nAChRs have exactly the same subunit composition and arrangement as those described for heterologously expressed nAChRs. For instance, it is still questionable whether native α7-containing receptors are homomeric. Analysis of the efficacy and potency of various agonists revealed that the EC50 values for ACh, nicotine and cytisine in activating type IA currents are approximately 130, 27 and 50 μM, respectively (fig. 2) (Alkondon and Albuquerque, 1993, 1995), whereas the EC50 values for these compounds in activating nicotinic currents in Xenopusoocytes expressing the α7 homomers are about 112, 7.8 and 18 μM, respectively (Gerzanich et al., 1994). According to these results, nicotine and cytisine are at least 3-fold less potent in evoking type IA current than in evoking nicotinic currents inXenopus oocytes expressing α7 homomers. In addition, DMPP acts as a full agonist in eliciting type IA currents in rat hippocampal neurons (Alkondon and Albuquerque, 1993, 1995), whereas it acts as a very weak partial agonist in evoking nicotinic currents through chick α7 nAChR homomers expressed in Xenopus oocytes (Gerzanichet al., 1994). Species-specific differences in the sequence of these subunits could account for these discrepancies, particularly because DMPP acts as a full agonist in human neuroblastoma cells heterologously expressing homomers of human nAChR α7 subunits (Penget al., 1994). The discrepancies between the apparent potency of an agonist in activating native α7 nAChRs and α7 nAChR subunits expressed in Xenopus oocytes could also be accounted for by the fact that posttranslational modifications of the α7 subunits in oocytes may differ from those that occur in mammalian systems, resulting in modifications of some of the properties of the receptors heterologously expressed in oocytes (Siviloti et al., 1995). In fact, it has been reported that protein processing in mammalian systems can be different from protein processing in the oocytes (Shi et al., 1994). Despite these explanations for the differences between the pharmacological properties of α-BGT-sensitive hippocampal nAChRs and those of homomers of α7 subunits heterologously expressed in Xenopus oocytes, it is still possible that the native α-BGT-sensitive nAChR in hippocampal neurons is a heteromeric receptor that bears the α7 subunit. Apparent potency of different agonists in eliciting type IA and type II currents in hippocampal neurons. Top graph portrays the concentration dependency of the activation by different nicotinic agonists of type IA currents in hippocampal neurons. All responses are normalized to the response of the neurons to ACh (3 mM), which is taken as 100%. Bottom graph illustrates the selectivity of nicotinic agonists in activating type IA and type II currents. The extent of activation of type IA currents at agonist concentrations which were effective in eliciting 0, 10, 30, 50, 70 and 90% of the maximal amplitude in type II currents is shown. Same color code applies to both graphs. The recent introduction of α-CTx-ImI as a competitive antagonist selective for α-BGT-sensitive, α7-bearing nAChRs in hippocampal neurons may represent a step forward toward the characterization of the structure of these native receptors (Pereira et al., 1996). α-CTxs, small peptides purified from the venom of Conussnails, are so named because they are potent inhibitors of the activation of muscle nAChRs (Myers et al., 1991). Some of the α-CTxs, particularly α-CTx-GI and α-CTx-MI, were very useful for the dissection of the molecular determinants of cholinergic binding sites on muscle nAChRs (Groebe et al., 1995). Thus, α-CTx-ImI could be a useful tool for the analysis of the components of the binding sites for competitive ACh antagonists on α7-bearing native nAChRs, and could unveil the characteristics of the structure and subunit composition of the receptor. Studies of the efficacy and potency of various agonists in activating different subtypes of neuronal nAChRs have led to the fundamental discovery that choline, the metabolic product of ACh degradationin vivo, acts as an agonist as efficacious as ACh at the α7 nAChRs in hippocampal neurons. Application of choline (10 mM) to hippocampal neurons that respond to ACh (3 mM) with type IA currents results in activation of currents with the same characteristics as and amplitudes similar to those of the ACh-evoked currents (fig. 2). The EC50 for choline in eliciting type IA currents in hippocampal neurons is about 1 mM (fig. 2). 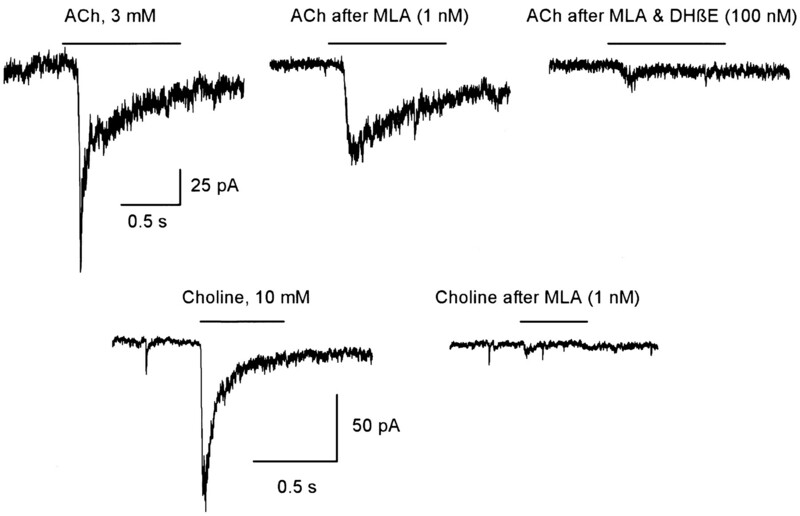 In contrast, choline (up to 10 mM) evokes no response in neurons that respond to ACh with type II currents, which indicates that choline does not activate the α4β2 nAChRs that subserve these currents (fig. 2). Some hippocampal neurons respond to ACh with a current that is referred to as type IB and has a fast and a slow component (fig.3) (Alkondon and Albuquerque, 1993; Alkondon et al., 1994). The fast component of type IB currents has the same pharmacological and kinetic properties as type IA currents (fig. 3), which indicates that it is subserved by α7 nAChRs. On the other hand, the properties of the slow component of type IB currents are the same as those of type II currents (fig. 3), which indicates that it is subserved by α4β2 nAChRs. In such neurons expressing both α7 and α4β2 nAChRs, choline only activates the fast-decaying current,i.e., the current subserved by α7 nAChRs (fig. 3). Characterization of neurons that express both α7 and α4β2 nAChRs. 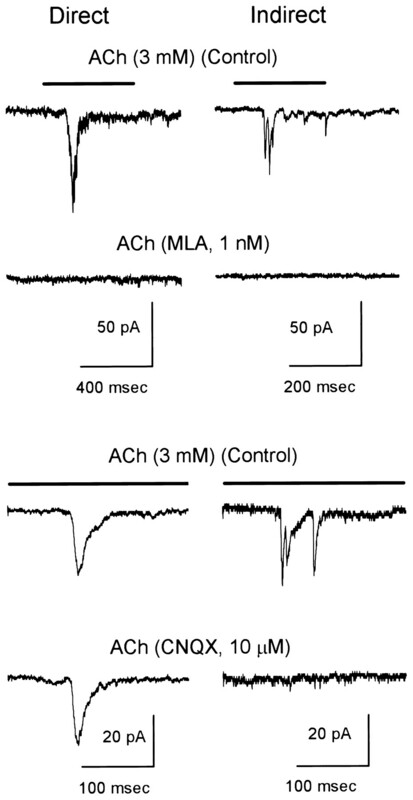 (top row) The fast component of ACh (3 mM)-evoked type IB current is blocked by the α7 nAChR antagonist MLA (1 nM), whereas the slow component is abolished by the α4β2 nAChR antagonist DHβE (100 nM). (bottom row) In another neuron that responds to ACh with type IB currents, choline evokes only the type IA current, which is abolished by MLA. At nAChR subtypes other than the α7 nAChRs, choline acts as an extremely weak nicotinic agonist (Mandelzys et al., 1995). Thus, the concept that ACh hydrolysis is the means by which ACh activity ends in vivo appears to be true for the cholinergic functions mediated by most nAChR subtypes, but not for those mediated by α7 nAChRs. Considering that choline uptake into the presynaptic terminal is a slow process, the concentration of choline in the synaptic cleft during synaptic activity could be sufficient to lead to the activation of α7 nAChRs. It is possible that cholinergic functions mediated by α7 nAChRs are limited or terminated by the agonist-induced inactivation of these receptors. These findings altogether bring novel concepts toward the development of therapeutic compounds to treat diseases in which the α7 nAChR activity is reduced. It seems logical that the use of anti-AChE or of full nicotinic agonists would not be a great help in such pathological conditions, unless a brief activation of the α7 nAChRs preceding receptor desensitization would be enough to trigger a cascade of long-lasting effects. Important clues about the possible physiological roles of the α-BGT-sensitive, α7-containing nAChRs in the CNS were obtained on the basis of the studies showing that these receptors, similar to the homomeric α7 nAChRs expressed in Xenopus oocytes, show a unique high permeability to Ca++ (Bertrand et al., 1993; Sands et al., 1993; Séguélaet al., 1993; Castro and Albuquerque, 1995). The ion selectivity of the native α-BGT-sensitive nAChRs in hippocampal neurons was determined on the basis of the analysis of the reversal potential (VR) of ACh-induced type IA currents under various ionic conditions (fig. 4). Using physiological salt solutions with different ion activities (table 1) and a Goldman-Hodgkin-Katz equation (equation 1) for VRshifts in the presence of Ca++, permeability ratios were calculated.PCaPCs=Cso2−Cso1eΔVR F/RT4 Cao1 eΔVR F/RT (1+eVR1 F/RT)−1−4 Cao2 (1+eVR2 F/RT)−1 Equation 1The VR values of ACh-evoked type IA currents were determined by use of physiological salt solutions with various ionic compositions, and the ATP-R internal solution was used in the recording pipette to prevent to a large extent the rundown of type IA currents. With this internal solution and the standard external solution, the VR of ACh-evoked type IA currents was 3.9 ± 0.3 mV (Castro and Albuquerque, 1995). The Ca++-dependent changes in VR were tested with Cs+ as the main cation on both sides of the membrane, and with physiologically relevant Ca++ concentrations. With Cs+-based external solution containing Ca++ (1 mM), the VR of ACh-evoked type IA currents was −3.0 ± 0.4 mV, and the VR NMDA-evoked currents was −2.7 ± 0.3 mV (fig. 4). When the extracellular concentration of Ca++ was increased to 10 mM, the V R of the ACh-evoked currents was shifted by 5.6 ± 0.4 mV, and the VR of the NMDA current was shifted by 8.3 ± 0.4 mV (fig. 4). On the basis of the VR shifts, one can conclude that the α-BGT-sensitive, neuronal nAChR channel is highly permeable to Ca++, although less than the NMDA receptor. Comparison of the Ca++ permeability of α7 nAChRs to that of NMDA receptors in hippocampal neurons. (A) The reversal potential of ACh-evoked type IA currents becomes more positive when the extracellular Ca++ concentration is increased from 1 to 10 mM. (B) The reversal potential of NMDA-evoked currents is also displaced to a more positive value upon increasing the extracellular Ca++ concentration from 1 to 10 mM. The ATP-regenerating intracellular solution and the Cs+-based external solution were used in these experiments (see table 1 for solution composition). Applying the shifts in VR to the GHK equation shown above, and assuming that only Cs+, Na+, and Ca++ contributed to the ACh- or NMDA-evoked currents, the permeability ratios were estimated for the α-BGT-sensitive nAChRs and the NMDA receptors. Substitution in equation 1 of the pairs of VR values obtained from experiments using the Cs+-based external solution containing either 1 mM (VR1) or 10 mM (VR2) Ca++ yielded an average P Ca/P Cs of 6.1 ± 0.5 for the ACh channel and of 10.3 ± 0.7 for the NMDA channel. The fraction of current carried by Ca++ can be estimated from theP Ca/P Cs using equation 2(Spruston et al., 1995).Pf=1+[M+][Ca2+]o1−exp (2FV/RT)4 PCa/PCs−1 Equation 2In this equation, which assumes that the permeability to all monovalent cations is the same and that the GHK equation can describe the relationship between permeability and current, [M +] is the total activity of monovalent cations on each side of the membrane and [Ca++]o is the extracellular activity of Ca++. In the experiments designed to determineP Ca/P Cs in the presence of 1 mM Ca++, the extracellular Ca++ activity was 0.27, and the total activity of monovalent cations was approximately 105. At room temperature, F/RT was taken to be 0.04 mV−1. Substituting these values and the permeability values in equation 2, we estimate that close to the resting potential of the hippocampal neurons (∼−50 mV) and in the presence of 1 mM extracellular Ca++, approximately 5.6% of the ACh-evoked type IA current is carried by Ca++, whereas approximately 9% of NMDA-evoked current is carried by Ca++. Thus, theoretically the Ca++ entry into hippocampal neurons through α-BGT-sensitive nAChRs is equivalent to approximately 60% of that through NMDA receptors. However, considering that the mean open time and the kinetics of inactivation of the NMDA receptor channel are much slower than those of the α7 nAChRs in hippocampal neurons (Castro and Albuquerque, 1993; Nelson and Albuquerque, 1994), the Ca++ influx through the NMDA receptor should be longer lasting than that through the α7 nAChR. Therefore, it is likely that NMDA-type glutamate receptors and native neuronal nAChRs made up of the α7 subunits are involved in different Ca++ signaling pathways (Teyler et al., 1994). The α7 nAChRs in hippocampal neurons, in addition to being permeable to Ca++, are also sensitive to changes in the [Ca++]o (Bonfante-Cabarcas et al., 1996). Extracellular Ca++ modulates the affinity of the α7 nAChRs for ACh, the cooperativity between ACh-binding sites, as well as the inward rectification, the decay phase, and rundown of α7-nAChRs-mediated type IA currents (fig. 5). Upon increasing the [Ca++]o from 10 μM to 1 mM, the apparent affinity of the α7 nAChRs for ACh increases and the cooperativity between ACh-binding sites decreases. In the presence of 10 μM [Ca++]o, the values of EC50 and Hill coefficient for ACh in eliciting type IA currents are 289 ± 51 μM and 2.7 ± 0.2, respectively, whereas in the presence of 1 mM [Ca++]o these values are 206 ± 43 μM and 1.2 ± 0.1, respectively. Further increase of the [Ca++]o to 10 mM decreases the apparent potency of ACh in evoking type IA currents and abolishes the cooperativity between the ACh-binding sites on the α7 nAChRs. In the presence of 10 mM [Ca++]o, the EC50 and the Hill coefficient for ACh in eliciting type IA currents are 262 ± 62 μM and 1.00 ± 0.1, respectively. 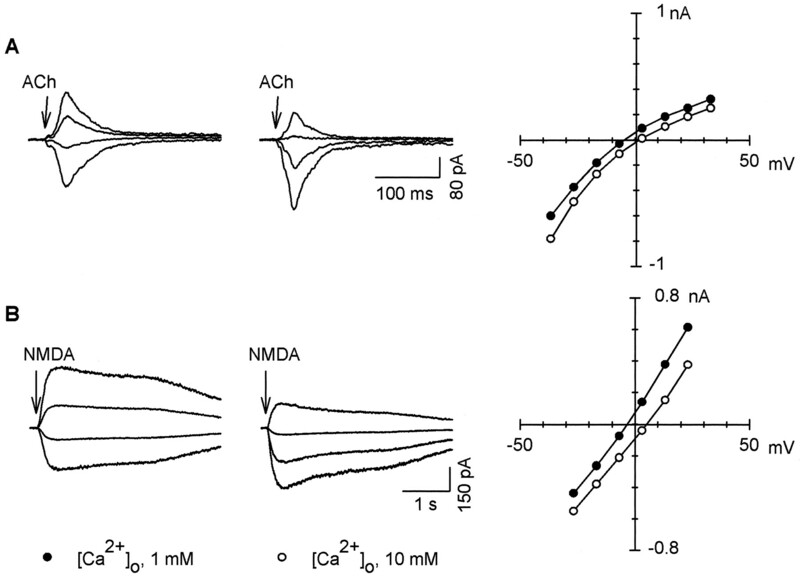 Several lines of evidence indicate that the effects of Ca++on the interaction of ACh with the α7 nAChRs in the hippocampus are mediated by the interactions of Ca++ with specific sites on the receptor rather than through nonspecific Ca++ sites on the membrane or through changes of surface potential (Bonfante-Cabarcaset al., 1996). Not only did the effects of Ca++on the receptor function follow sigmoid functions, which is expected for effects mediated by specific binding sites, but also calculated surface potential varied by less than 10% for different values of surface charge density. It is likely that binding of Ca++to the α7 nAChR in the hippocampus controls the concerted transformation of the subunits to yield various open-channel states (Bonfante-Cabarcas et al., 1996). This concept is in agreement with the multiple channel conductance states reported for the α7 nAChRs in hippocampal neurons (Castro and Albuquerque, 1993). Sensitivity of α7 nAChRs in hippocampal neurons to extracellular Ca++. (left, top graph) Rundown of type IA currents in the presence of different extracellular Ca++concentrations. Holding potential, −50 mV. (right, top graph) Concentration-response relationship for ACh in evoking type IA currents in the presence of various concentrations of extracellular Ca++. Holding potential, −50 mV. (bottom, left graph) Current-voltage relationship for ACh (3 mM)-evoked type IA currents in the presence of different concentrations of extracellular Ca++. A malate-based internal solution was used in these experiments [see Bonfante-Cabarcas et al. (1996) for detailed solution composition]. (bottom, right graph) Comparison of the decay phase of ACh (3 mM)-evoked type IA currents in the presence of 1 or 10 mM extracellular Ca++. A 500-msec pulse of ACh was applied to the neurons at the downward arrow. Various traces of currents recorded under each condition are aligned and superimposed. The amplitude of all traces is normalized for comparison of the decay phase of the currents. The ATP-regenerating solution was used in this series of experiments. Holding potential, −56 mV. The decay phase of type IA currents evoked by saturating concentrations of ACh (≥1 mM) is accounted for by the desensitization of the α7 nAChRs (Castro and Albuquerque, 1993) and is accelerated by increasing the [Ca++]o from 2 mM to 10 mM (fig. 5). In the presence of 2 mM [Ca++]o, ACh (1 mM)-evoked type IA currents have a decay-time constant of about 20 msec, whereas in the presence of 10 mM [Ca++]o, the currents have a decay-time constant of about 10 msec (Castro and Albuquerque, 1995;Bonfante-Cabarcas et al., 1996). Thus, extracellular Ca++ plays an important role in the rate of desensitization of the α-BGT-sensitive, α7 nAChRs. Changes in [Ca++]o also affected the inward rectification of type IA currents, which depends on the intracellular concentrations of Mg++. When recording type IA currents using a F−-containing internal solution, no inward rectification is observed. However, when a nominally Mg++-free, malate-based internal solution is used and the extracellular solution contains 2 mM Ca++, the rectification of type IA currents is confined to a short range of membrane potentials (0–30 mV). On raising the intracellular concentration of Mg++ to 10 mM, the inward rectification persists up to 50 mV; and, if concomitantly the [Ca++]o is lowered to 0.3 mM or less, the rectification persists up to 70 mV (fig. 5). Thus, the inward rectification of type IA currents, which is maximal in the presence of low extracellular Ca++ concentrations and added intracellular Mg++, can be reversed when the extracellular Ca++ concentration is increased to levels considered to be within the physiological range, which indicates that depending on the ongoing synaptic activity and levels of Ca++ surrounding the α7 nAChR, the receptor activity at positive potentials can range from being negligible to being very high. The activity of many ligand-gated ion channels is subject to modulation by ligands other than the natural agonist. Two typical examples are noted: positive modulation of the NMDA receptor activity by glycine (Johnson and Ascher, 1992; Scatton, 1993), and of the GABAA receptor activity by benzodiazepines and steroids (McDonald and Twyman, 1992). There is increasing knowledge of allosteric ligands that control the activation of ligand-gated receptors such as the GABAA receptors and the nAChRs, and very recently our studies have provided evidence for the existence of a site on the nAChRs through which the receptor channel activity can be potentiated by ligands referred to as noncompetitive agonists (fig.6). Schematic representation of the GABAAreceptor and the nAChR showing the sites through which receptor activity can be modulated. Barb, barbiturates; PTX, picrotoxin; BDZ, benzodiazepines; NCA, noncompetitive agonists (e.g., galanthamine); LA, local anesthetics; Ara, arachidonic acid. In 1985, studies from this laboratory demonstrated that some anti-AChE, particularly the carbamate physostigmine, activate the muscle nAChR in frog single muscle fibers and that this effect was unrelated to the blockade of AChE (Shaw et al., 1985; Albuquerque et al., 1988). At the time, a fundamental concept emerged supporting the notion that, in addition to blocking AChE, anti-AChE can also directly modify nAChR function, either by acting as open-channel blockers or by potentiating the nAChR activity. Subsequently, biochemical studies showed that physostigmine can also activate theTorpedo nAChR (Kuhlmann et al., 1991; Okonjoet al., 1991). A major discovery came with the demonstration that the nicotinic agonist action of physostigmine is not inhibited by competitive nicotinic antagonists, being sensitive only to inhibition by the nAChR-specific monoclonal antibody FK1 (Okonjo et al., 1991). These findings indicated that physostigmine activates the nAChR channel by binding to a site distinct from that for ACh and other classical nicotinic ligands. Photoaffinity labeling of theTorpedo nAChR with [3H]physostigmine revealed that physostigmine binds to a region on the nAChR α subunits that includes and/or surrounds the amino acid Lys-125. Given that the epitope for the antibody FK1 is located on the amino acid sequence 118 to 142 on the nAChR α subunit (which is close to, but distinct from, the nAChR region to which ACh binds), and that this antibody antagonizes the agonist action of physostigmine without affecting that of ACh, it is most likely that the ability of physostigmine to activate the muscle-type nAChR is mediated by its binding to the region including and surrounding the amino acid Lys-125 on the nAChR α subunit. By electrophysiological techniques, we have been able to demonstrate that the novel agonist effect of physostigmine is not confined to the muscle nAChR. Physostigmine was shown to evoke single-channel currents when applied to outside-out patches obtained from, 1) hippocampal neurons (which express predominantly the fast-desensitizing, α7-bearing neuronal nAChRs), 2) mammalian fibroblasts (M10 cells) that stably express the α4β2 nAChR upon induction with dexamethasone, and 3) PC12 pheochromocytoma cells (which express at least three subtypes of neuronal nAChRs) (figs. 7 and8) (Pereira et al., 1993a, 1994; Storchet al., 1995). These currents were characterized as nicotinic because, although being insensitive to blockade by competitive ACh antagonists, they were sensitive to blockade by FK1 (figs. 7 and 8). Supporting the concept that physostigmine-evoked single-channel currents were nicotinic currents, physostigmine was shown to be unable to evoke single-channel currents in outside-out patches from M10 cells in which the nAChR expression was not induced by dexamethasone (Pereira et al., 1994). The findings that physostigmine activates a variety of nAChR subtypes and the region bearing the physostigmine-binding site, i.e., the region including and/or surrounding the amino acid Lys-125 is well conserved among all the nAChR α subunits sequenced to date (Pereira et al., 1993a,b) suggest that this novel binding site may be critical for the nAChR function in vivo. In addition to physostigmine, the anti-AChE galanthamine, the muscle relaxant benzoquinonium and the opioid codeine, all of which are structurally related to physostigmine, were found to activate the nAChR channelvia the physostigmine-binding site (Pereira et al., 1993a,b, 1994; Storch et al., 1995). Activation by physostigmine of nicotinic single-channel currents in outside-out patches excised from hippocampal neurons is inhibited by FK1. (left traces) Sample recordings of single-channel currents evoked by application of the classical nicotinic agonist (+)-anatoxin-a (AnTX) or by application of physostigmine (PHY) to outside-out patches excised from hippocampal neurons in culture. The agonist effect of PHY, but not that of AnTX, is inhibited by FK1. (right graph) Quantification of the effect of FK1 on AnTX- and PHY-induced nAChR activity in hippocampal neurons. The frequency of channel activity evoked by the agonists in the absence of FK1 was taken as 100% and used to normalize the frequency of channel activity recorded in the presence of FK1. Activation by AnTX, physostigmine and galanthamine of nicotinic single-channel currents in outside-out patches excised from M10 cells expressing α4β2 nAChRs. (top traces) Sample recordings of single-channel currents evoked by application of the classical nicotinic agonist (+)-anatoxin-a (AnTX), or by application of physostigmine (PHY) or galanthamine (GAL) to outside-out patches excised from fibroblasts stably expressing α4β2 nAChRs (M10 cells). Receptor expression in the M10 cells was induced by 3 to 5-day exposure of the cells to dexamethasone (1 μM). The agonist effect of GAL and PHY (not shown), but not that of AnTX, is inhibited by FK1. In contrast, the agonist effect of AnTX, but not that of GAL or PHY (not shown), was sensitive to blockade by DHβE (30 nM), a competitive nicotinic antagonist specific for the α4β2 nAChRs. (bottom graph) Quantification of the effect of FK1 and DHβE on AnTX- and GAL-induced nAChR activity in hippocampal neurons. The frequency of channel activity evoked by the agonists in the absence of antagonists was taken as 100% and used to normalize the frequency of channel activity recorded in the presence of the antagonists. To investigate the relevance of this physostigmine-binding site for the nAChR function, physostigmine and structurally related compounds were tested for their abilities to evoke nicotinic whole-cell currents and to modulate the nAChR activity induced by classical nicotinic agonists (Pereira et al., 1993a,b, 1994; Storch et al., 1995). Physostigmine and its 1-methyl derivative, galanthamine and 1-methylgalanthamine, benzoquinonium and codeine were unable to evoke nicotinic macroscopic currents (fig. 9). Instead, by binding to the newly identified site on the nAChRs, physostigmine-like compounds were shown to modulate ACh-induced nAChR activity in different preparations (figs. 9 and 10). Galanthamine and 1-methylgalanthamine increased the peak amplitude of nicotinic whole-cell currents evoked by application of nonsaturating concentrations of ACh (or other classical nicotinic agonists) to PC12 cells and cultured hippocampal neurons, an effect that could be blocked by FK1 (figs. 9 and 10). Also, by acting via the physostigmine-binding site, galanthamine or its 1-methyl derivative was capable of preventing the α7-bearing nAChRs in hippocampal neurons and the neuronal nAChRs expressed in PC12 cells from undergoing desensitization (figs. 9 and 10) (Schrattenholz et al., 1996). In this regard, the effect of galanthamine and related compounds on the nAChRs resembles that of the benzodiazepines on GABAA receptors (McDonald and Twyman, 1992). Potentiation of nicotinic responses by methylgalanthamine in PC12 cells. Top traces show that methylgalanthamine (methyl-GAL) by itself is unable to evoke whole-cell currents when applied to PC12 cells, where it increases the peak amplitude of whole-cell currents evoked by application of a nonsaturating concentration of ACh (100 μM) to the cells. In the presence of methyl-GAL, the peak amplitude of the nicotinic currents evoked by ACh (100 μM) was similar to that of the currents evoked by the saturating concentration of ACh (1 mM) in the absence of methyl-GAL. Note, however, that in the presence of methyl-GAL, the nicotinic current evoked by ACh (100 μM) does not desensitize as much as does the current recorded by the saturating concentration of ACh, although both currents had about the same magnitude. (bottom graph) Histogram of the distribution of the amplitude of nicotinic currents evoked by application to various PC12 cells of ACh alone or by ACh in the presence of methyl-GAL. Note that in the presence of methyl-GAL, the currents have larger amplitudes than in the absence of the drug. Holding potential, −60 mV. 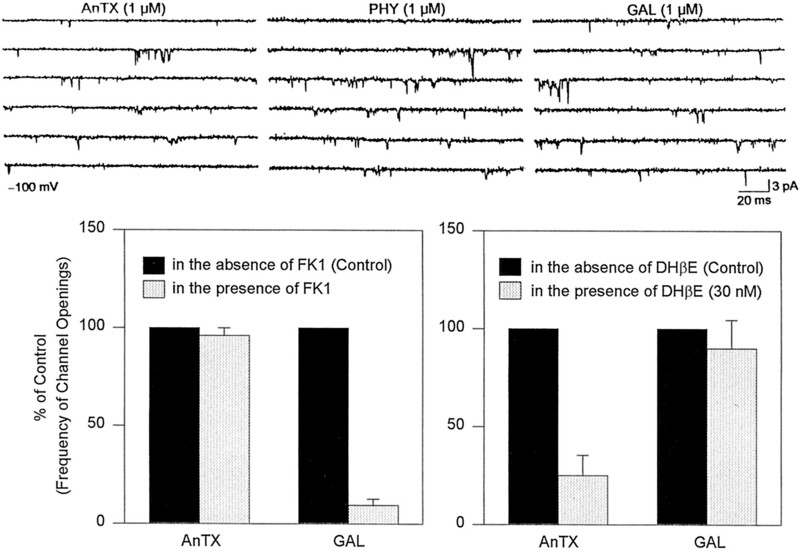 Potentiation by galanthamine of (+)-anatoxin-α (AnTX)-evoked currents in hippocampal neurons is sensitive to blockade by FK1. (A) Galanthamine (GAL) increases the peak amplitude of whole-cell currents evoked by application of a nonsaturating concentration of AnTX (10 μM) to hippocampal neurons in culture. In the presence of FK1, however, the effect of methyl-GAL is blocked. (B) Quantification of the effect of GAL on AnTX-evoked type IA currents in hippocampal neurons and of its sensitivity to blockade by FK1. (C) Note that in the presence of GAL, AnTX-evoked type IA current does not desensitize as much as does the current recorded in the absence of GAL. The region of the nAChR α subunits that bears the binding site for physostigmine, galanthamine, codeine and benzoquinonium has unique characteristics. In contrast to most of the N-terminal extracellular domain of the nAChR α subunits, the region between amino acids 118 and 137, which is part of the epitope region for FK1 and surrounds and includes the amino acid Lys-125 (the residue that is affinity labeled by [3H]physostigmine) (Schröder et al., 1994), is amphipathic (Stroud et al., 1990). It has two hydrophilic residues, lysine itself and glutamate, and many hydrophobic residues, five of which are aromatic amino acids. According to the model proposed by Stroud et al. (1990), this region of the nAChR α subunits may have a β-pleated sheet conformation. Thus, if one assumes that the residue Lys-125 is located at the bottom of a gorge, the two strings of amino acids lining the gorge will be hydrophobic in essence with many π electron clouds around. This structure resembles that of the ACh binding region of AChE (Sussmanet al., 1993) and may explain why many AChE inhibitors can interact with the region including and/or surrounding the residue Lys-125 of the nAChR α subunits. Because some studies have indicated that indolamines, including the neurotransmitter 5-HT, can interact with the AChE found in the plaques of patients with Alzheimer’s disease (Wright et al., 1993), and given the apparent correlation between the ability of some anti-AChE compounds to bind to the active site of AChE and to the novel nAChR binding site, 5-HT was tested for its ability to modulate ACh-evoked responses in PC12 cells. Of interest, 5-HT was shown to mimic the potentiating action of galanthamine on ACh-evoked currents in PC12 cells (Schrattenholzet al., 1996). This result and the previous finding that the opioid codeine, which is structurally related to galanthamine, can activate nAChR channels via the same mechanism as physostigmine suggest that 5-HT and, by inference, endogenous opiates could act as endogenous allosteric modulators of the nAChR function by binding to this novel nAChR site. There is increasing evidence that a given substance can control synaptic activity in the brain by acting as the primary agonist in one neurotransmitter system and as a modulator in another system. Glycine is a classical example of such an endogenous substance. Whereas in glycinergic synapses glycine activates glycine-gated channels, in the glutamatergic system glycine acts as a coagonist at the NMDA-receptor channels. Considering our findings, 5-HT may act as a full agonist in serotoninergic synapses and as a neuromodulator of the cholinergic neurotransmission involving nAChRs. Development of novel therapeutics, therefore, should take into account that the CNS function, in addition to being controlled by a neuronal network established by the neuronal wiring, could also be controlled by a chemical network established by the dual action of a single substance acting as a neurotransmitter in one system and as a neuromodulator in another system. This concept becomes very important when dealing with drugs that act on neuronal nAChRs, particularly those composed of α7 subunit, because it indicates that the function of these receptors could be modulated indirectly by alterations of the functions of neurotransmitter systems other than the cholinergic system itself. In our electrophysiological studies, we have provided evidence that a single hippocampal neuron can express more than one nAChR subtype (see fig. 3) (Alkondon and Albuquerque, 1993; Alkondon et al., 1994). However, there have been no studies dealing with the distribution of the different nAChR subtypes on the surface of the hippocampal neurons. The issue of receptor distribution on the neuronal surface becomes critical because the physiological role of a given receptor may be determined by its location on the neuronal surface. For instance, it has been shown that upon high-frequency stimulation of presynaptic fibers, NMDA receptors are activated postsynaptically, resulting in a APV-sensitive increase in intracellular Ca++ levels, which is confined to the activated distal dendritic regions (Regehr and Tank, 1990). The same high-frequency stimuli can induce an APV-insensitive increase in intracellular Ca++ in proximal dendritic regions, which indicates that Ca++-permeable channels other than the NMDA receptor channels are expressed in the proximal areas of the dendrites of hippocampal neurons and control Ca++ entry in these cell compartments (Regehr and Tank, 1990). By means of immunofluorescence, L-type Ca++ channels have been shown to be clustered on the cell body and on the base of major dendrites of hippocampal neurons (Westenbroek et al., 1990). These findings support the concept that segregation of these Ca++-permeable channels on the neuronal surface is critical for integration and processing of a synaptic input to the neurons. Although the NMDA receptors, being at high density on distal dendritic regions, may serve a direct role in the induction of LTP at activated synapses, the L-type Ca++ channels, being at high density on the cell body and proximal dendritic areas, may mediate intracellular regulatory events in the cell body in response to the same synaptic inputs that lead to LTP at the distal dendritic areas of hippocampal neurons. We have addressed the distribution of nAChRs on the surface of hippocampal neurons by recordings of whole-cell currents evoked by focal application of ACh to well-defined areas on the surface of hippocampal neurons. The set-up used in this study consisted of 1) a motor-operated upright microscope that could be moved independently from the preparation-bearing stage, 2) an infrared filter, an infrared camera and an image processor that enhanced the contrast of the image of the neurons allowing for estimation of distances with a precision of 0.5 to 1 μm and for visualization of minute areas of the neuronal surface, including areas rich in dendritic spines, 3) a computer-driven system that controlled the movements of the micromanipulators bearing the recording pipette and the drug-delivery pipette and made it possible to focally apply agonists of specific receptors to well-defined regions on the neuronal surface, and 4) a pressure-ejection unit that was used to release the agonist onto the surface of the neurons (Alkondon et al., 1996a). The pipettes used to apply agonists to the neurons had tip diameters <1 μm to prevent receptor desensitization by agonist leak from the pipette tip, which can preclude the detection of the fast-desensitizing, type IA currents and other fast desensitizing responses such as GABA-activated Cl− currents. Also, the flow of the bath perfusion was directed opposite to the flow of the agonist solution from the agonist-delivery pipette. Maximal activation of the receptors located on the area covered by the agonist solution was achieved when the agonist-delivery pipette was positioned at 2 μm from the border of the neuronal surface, the duration of agonist application was about 15 ms and the pressure to eject the agonist from the pipette was 20 pSi. Keeping the distance of the pipette from the border of the neuronal surface fixed at 2 μm, and the parameters for agonist application to the cells fixed at 15-msec duration and 20-pSi pressure ejection, the agonist solution reached a forward distance of about 15 μm and covered a lateral distance of 15 μm (Alkondon et al., 1996a). This advantageous technique is unique because it allows for the investigation of the distribution of pharmacologically and kinetically identified functional receptors over the neuronal surface. However, it has some drawbacks. Given that the responses to agonists are recorded from the cell body and the currents are evoked by agonist application to remote areas of the neuronal surface, part of the currents may be filtered by the cable properties, and the peak current amplitude may be underestimated. Thus, our studies were limited to regions within 60 μm from the recording pipette, distance at which contribution of cable filtering was negligible as determined by the analysis of the relationship between rise time and peak amplitude of currents evoked by application of the agonists to different parts of the neurons (Alkondonet al., 1996a). Application of ACh (3 mM) in the presence of atropine (1 μM) to well-defined areas of the majority of the neurons resulted in activation of fast-desensitizing, MLA-sensitive, type IA current. In these neurons, application of ACh to the dendritic extensions resulted in the activation of type IA currents whose amplitudes were smaller than those of the currents evoked by application of ACh to the cell body (fig. 11). Mapping of nAChRs on the somatodendritic domains of hippocampal neurons. (left panel) Infrared image of a hippocampal pyramidal neuron in culture is shown. (middle panels) Frames of images illustrate the positions of the agonist-delivery pipette at different regions of the same neuron. (right panels) Traces of currents (type IA) induced by a 25-msec pressure application of ACh (3 mM) to the neuronal areas shown in the middle panels are shown. Holding potential, −56 mV. Considering that the peak amplitude of whole-cell currents evoked by activation of a single receptor subtype is proportional to the number of individual receptors activated by the agonist, an estimate of the current density at different areas of the neuronal surface can provide important information about the receptor density distribution in such neuronal areas. Plots of the current density (estimated as the current amplitude recorded from the soma/membrane area exposed to the agonist, i.e., pA/μm2) against the distance from the soma at which the agonist was applied revealed that the density of type IA currents is substantially higher on the apical and basal dendrites of pyramidal neurons and on the dendrites of bipolar neurons than on the soma of these neurons (fig.12). 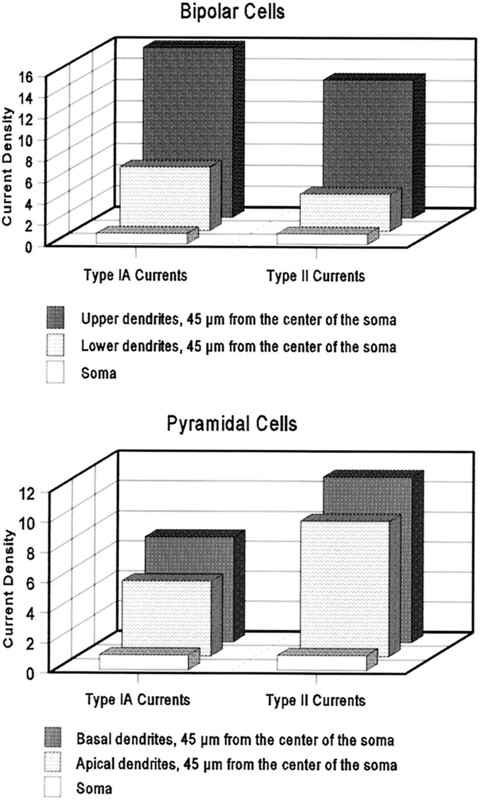 Considering that the same single-channel conductance accounts for type IA currents evoked at the soma or at the dendrites, it is clear that the density of α7-bearing nAChRs is higher on the dendrites than on the cell body of the neurons. The same analysis of type II currents evoked by application of ACh to various areas of the surface of hippocampal neurons and recorded from the cell body provided evidence that α4β2 nAChRs are also at higher density on the dendrites than on the soma of these neurons. Analysis of the type IA and type II currents generated at more remote dendritic areas (up to 60 μm from the center of the soma) indicated that the current density in dendritic areas increases with the distance from the center of the soma (fig. 12). These findings are in agreement with previous immunocytochemical studies of the specific binding of the nAChR-specific monoclonal antibodies FK1 and WF6 to hippocampal neurons, which revealed that spots of high-density immunolabeling, indicative of synaptic regions, could be found along the dendrites (Schröder, 1992; Pereira et al., 1993a). Relative distribution of nAChRs that give rise to type IA and type II currents in hippocampal neurons in culture. Histograms show the distribution of the current density (pA/μm2), which is directly proportional to receptor density, at various neuronal areas. The current density (pA/μm2) at dendritic segments was normalized to that at the soma. Although the NMDA receptors and the α7 nAChRs are apparently located on similar areas of the hippocampal neurons and have a high Ca++ permeability that can account for a sizable increase in Ca++ influx into the neurons, it is likely that these receptors have nonoverlaping roles in controlling changes in intracellular levels of Ca++, because of the inward rectification of α7 nAChRs-mediated currents and the outward rectification of NMDA-induced currents. At positive membrane potentials, α7 nAChRs may not be functional because of their blockade by intracellular Mg++ (see fig. 1) (Alkondon et al., 1994; Bonfante-Cabarcas et al., 1996), whereas NMDA receptors are fully operational. In contrast, at negative membrane potentials, α7 nAChRs would be fully operational, whereas NMDA receptors would be blocked by extracellular Mg++ (Nowaket al., 1984; Mayer and Westbrook, 1987). Thus, one could expect some synaptic integration to take place in dendritic spines that express both NMDA receptors and α7 nAChRs. For instance, it is possible that activation of the α7 nAChRs by ACh (or choline), similar to activation of the AMPA-type glutamate receptors, could lead to a local depolarization of sufficient magnitude to remove Mg++ from the NMDA receptor rendering this receptor fully activatable. It is also feasible that increase in the intracellular Ca++ levels caused by Ca++ entry into the neurons by activation of α7 nAChRs modulates the activation of the NMDA receptors. It should be emphasized that Ca++ influx into dendrites plays a critical role in the induction of LTP in hippocampal neurons (Christie et al., 1996). The physiological relevance of functional nAChRs in CNS neurons is still the subject of extensive investigation. Much of the knowledge available regarding the possible functions of the discrete subtypes of neuronal nAChRs is based on indirect clues obtained from behavioral studies of agonists and antagonists of the many CNS nAChR subtypes. It has been demonstrated that in rats, (−)-lobeline, (−)-nicotine and (−)-cytisine (Haroutunian et al., 1985; Deckeret al., 1993) can improve retention test performance and water maze deficits produced by septal lesions. Likewise, systemic administration of the nicotinic agonists anabasine, anabaseine and anabaseine derivatives to rats can improve many memory tasks (Meyeret al., 1994). The ability of nicotinic ligands to displace [3H]cytisine binding has been associated with their specific binding to the α4β2 nAChR subtype, whereas the ability of such ligands to displace α-[125I]BGT binding has been associated with their specific binding to the α7 nAChR subtype (Happeet al., 1994; Barrantes et al., 1995). The rank order of potency for nicotine, anabasine, anabaseine, and anabaseine derivatives in improving cognition does not completely match the rank order of potency for these compounds in displacing the binding of (−)-cytisine, which suggests that at least two different subtypes of neuronal nAChRs are involved in memory acquisition (Meyer et al., 1994). In fact, anabaseine and its derivatives have been shown to be selective agonists of α7-containing nAChRs (Briggset al., 1995) and to facilitate induction of LTP (Hunteret al., 1994). Thus, it is likely that both α4β2- and α7-bearing nAChRs play important roles in cognitive functions. Initial studies have shown that DHβE, a specific competitive antagonist at the α4β2 nAChR, impaired water maze performances when administered intracerebroventricularly in rats, whereas MLA, a specific competitive antagonist of ACh at the α7-containing nAChRs, produced a transient improvement of the performance of rats to find the hidden platform in the water maze test (Curzon et al., 1994). These findings suggested that acquisition of spatial information is modulated by distinct nAChR subtypes. However, no additional information is available regarding the effects of selective nicotinic antagonists on other learning and memory tasks. Anxiolytic effects of systemic administration of (−)-nicotine and other nicotinic agonists have been observed in laboratory animals and in human beings (Pomerleau, 1986). These effects are not common to all nicotinic agonists, given that systemic administration of cytisine, epibatidine, anabasine, anabaseine and its derivatives to rats has no effects on anxiety. Thus, it is likely that the anxiolytic effects of some nicotinic agonists are accounted for by the actions of these agonists on a specific subtype of neuronal nAChR. Of therapeutic interest, the anxiolytic effects of nicotinic agonists, in contrast to those of benzodiazepines, are not accompanied by cognitive deficits. Unfortunately, the anxiety frequently observed in patients with Alzheimer’s disease is still treated with benzodiazepines. The development of a nicotinic agonist with anxiolytic effects would be of great advantage for these patients. (−)-Nicotine and many nicotinic agonists have an analgesic effect in animal species (Pomerleau, 1986; Badio and Daly, 1994). The findings that this effect can be prevented if the animals are pretreated with mecamylamine, but not with hexamethonium, indicates that this effect is mediated by CNS actions of the nicotinic agonists. It seems that antinociception by nicotinic agonists is associated with a specific subtype of neuronal nAChR, because agonists that are more selective for α4β2 neuronal nAChRs, e.g., nicotine and (±)-epibatidine, can induce analgesia when administered to mice and rats, whereas agonists that are more selective for the α7-bearing nAChRs, e.g., anabaseine and its derivatives, are ineffective antinociceptives. Although the exact mechanism by which activation of neuronal nAChRs leads to analgesia remains to be determined, cholinergic synaptic transmission mediated by α4β2 nAChRs has been observed in brainstem slices containing both the nucleus ambiguus and the zona intermedialis reticularis parvicellularis of the rostral medulla oblongata, which are part of the nociceptive pathways. Fast excitatory spontaneous postsynaptic potentials, whose amplitude and frequency can be decreased markedly by DHβE, have been recorded from neurons of the nucleus ambiguus, hence suggesting that α4β2 nAChRs expressed in neurons of this nucleus are innervated by cholinergic neurons present in the slice (Zhang et al., 1993). Retrograde tracing of the afferents to the nucleus ambiguus combined with choline acetyltransferase immunocytochemistry revealed that the zona intermedialis reticularis parvicellularis of the medulla oblongata is the main source of cholinergic input to the nucleus. In fact, electric stimulation of the zona intermedialis reticularis parvicellularis resulted in activation of excitatory postsynaptic potentials in neurons of the nucleus ambiguus that were very sensitive to blockade by DHβE (2–5 pmol); DHβE reversibly reduced the peak amplitude of the indirectly elicited postsynaptic potentials (Zhanget al., 1993). Because there is no evidence that α-BGT-sensitive, α7 nAChRs mediate fast, excitatory synaptic transmission in the CNS, it has been speculated that these receptors may modulate synaptic function, neuronal signaling, and neuronal development. In fact, α7-containing neuronal nAChRs have been shown to control neurite outgrowth and excitotoxicity (Chan and Quik, 1993; Akaike et al., 1994;Pugh and Berg, 1994; Donnelly-Roberts et al., 1996). The high Ca++ permeability of the α7 nAChRs suggests that these receptors may be involved in many other neuronal functions that are dependent on the intracellular levels of Ca++. In addition to hippocampal neurons, neurons from the olfactory bulb of rats express α7 nAChRs (Alkondon and Albuquerque, 1994). Activation of these receptors results in elicitation of fast-desensitizing, α-BGT-sensitive currents that resemble type IA currents recorded from the hippocampal neurons (fig. 13). More interesting, however, is the fact that application of ACh or other nicotinic agonists to some olfactory bulb neurons in culture results in a substantial increase in the frequency of spontaneous postsynaptic currents (fig. 13) (Alkondon et al., 1996c). This increase in the frequency of spontaneous postsynaptic currents is inhibited reversibly by MLA (1 nM) and lasts for a few milliseconds after the neurons are exposed to ACh (Fig. 13), which indicates that this response is mediated by α7 nAChRs. Using antagonists of various ligand-gated receptors, it was possible to demonstrate that the neurotransmitter accounting for the postsynaptic currents whose frequency was increased by the nicotinic agonist is glutamate, and that the receptor mediating such currents is the AMPA-type glutamate receptor (fig. 13). Finally, because the ACh-induced increase in glutamate release is insensitive to TTX, the α7 nAChR should be located on the presynaptic side of glutamatergic synapses, whereby its activation leads to modulation of transmitter release (Alkondonet al., 1996c). Thus, in olfactory bulb neurons of the rat, α7 nAChRs located on presynaptic glutamatergic terminals are capable of modulating the function of glutamatergic synapses by controlling the release of glutamate (fig. 13; Alkondon et al., 1996c). Presynaptic α7 nAChRs have also been reported to control the release of glutamate in chick brain neurons and in neurons of the CA3 field of the hippocampus (McGehee et al., 1995; Gray et al., 1996). Evidence for the presence of postsynaptic and presynaptic α-BGT-sensitive nAChRs in olfactory bulb neurons. ACh-evoked whole-cell current (Direct) that is blocked by MLA but not by CNQX is mediated by postsynaptic nAChRs. ACh-evoked whole-cell currents (Indirect) that are blocked by both MLA and CNQX represent activation of presynaptic nAChRs located on glutamatergic terminals. Although neurons in culture maintain many of their native properties, the expression of certain proteins can be affected substantially by the composition of the medium used to culture the neurons. Thus, to prove that functional nAChRs are indeed expressed in mammalian CNS neurons developed in vivo, and that the characteristics of these receptors are not different from those of the receptors expressed in cultured neurons, we have applied the patch-clamp technique to neurons dissociated from various areas of the rat brain. For many years, the use of acutely dissociated neurons has been hampered by the lack of a reliable and reproducible method that would allow for the dissociation of single neurons without excessive damage. Most of the studies directed at characterizing the properties of functional ligand-gated ion channels expressed in neurons of the central or the peripheral nervous systems have relied on the use of proteolytic enzymes as dissociating agents. However, such enzymes alter the sensitivity of ligand-gated channels to their natural agonists or to allosteric ligands. For instance, the NMDA receptors of hippocampal neurons are inactivated by trypsin (Allen et al., 1988). Recent studies on single muscle fibers have also shown that the extracellular domain of nAChRs is highly sensitive to enzymatic treatment (Nascimento et al., 1996). After proteolytic treatment of frog muscles for isolation of single muscle fibers, the frequency of ACh-evoked single-channel currents as well as the frequency of single-channel currents elicited by physostigmine-like compounds decrease with increasing exposure of the muscle fibers to proteases. If neuronal α7 nAChRs were as sensitive as muscle nAChRs to proteolytic treatment, one would expect to find small nicotinic responses in neurons enzymatically dissociated from the hippocampus. Thus, to overcome the problem of enzymatic treatment, an improved technique was developed in our laboratory that allows for the isolation from specific CNS areas of single viable neurons bearing many long dendrites (fig. 14) (Barbosa et al., 1996). Characterization of ligand-gated channels in mechanically dissociated neurons. Infrared images of rat (P15) CA1 hippocampal neurons that were acutely dissociated without the assistance of enzymes. Type IA nicotinic current elicited by application of ACh to one of these neurons is shown at the bottom. Application of ACh or other nicotinic agonists to most neurons mechanically dissociated from the CA1 field of the hippocampus of 3- to 25-day-old rats resulted in activation of fast-desensitizing, MLA-sensitive nicotinic currents whose characteristics resembled those of type IA currents recorded from hippocampal neurons in culture. Approximately 65% of the acutely dissociated hippocampal neurons responded to ACh with type IA currents whose peak amplitude varied between 15 and 750 pA at the membrane potential of −50 mV (Barbosaet al., 1996). The average amplitude of the currents recorded from the hippocampal neurons dissociated mechanically according to this technique was larger than that of the currents recorded from mechanically dissociated hippocampal neurons bearing short dendrites (Ishihara et al., 1995; Barbosa et al., 1996). This discrepancy could be accounted for by the fact that a large number of nAChRs is found in the dendrites (Alkondonet al., 1996a). That the mechanically dissociated neurons are viable and suitable for characterization of the elements participating in synaptic transmission was proven by the finding that spontaneous postsynaptic currents could be recorded from many of these neurons (see fig. 14), and that the frequency of these currents could be altered by cations known to alter transmitter release, e.g., Pb++ (Barbosaet al., 1996). Therefore, not only do the mechanically dissociated neurons bear long dendritic branches but they also retain functional synaptic terminals attached to them. The development of this powerful technique has allowed us to proceed forward into the studies of the properties of functional ligand-gated channels expressed in neurons from the human brain (Pereira et al., 1997). In an attempt to characterize the subtypes of ligand-gated channels in neurons from the human brain aiming at defining the effects of agonists, antagonists, and other modulators of receptor activity, particularly molecules that have proven useful to treat and/or prevent a number of neuropathological conditions including epilepsy and Alzheimer’s disease, we have applied the methodology of mechanic dissociation to samples of lateral cortex removed during temporal lobectomy from epileptic patients. The specimens were taken from the route of access to the damaged area of the brain of the patients subjected to the neurosurgical procedure, and were, therefore, unlikely to be affected by the pathological condition. Like the neurons acutely dissociated from the rat brain, neurons acutely dissociated from human neocortical specimens showed high frequency of spontaneous postsynaptic currents, indicating that they also retained on their surface functional synaptic terminals. In addition, these neurons responded to ACh (1 mM) with fast-desensitizing currents whose characteristics resembled those of type IA currents. This constitutes the first direct evidence that functional α7-type nAChRs are indeed expressed in the human brain (Pereira et al., 1997). A substantial amount of information regarding the physiological roles of some ligand-gated ion channels and voltage-gated ion channels has been gathered from studies on brain slices. Although in-depth analyses of the pharmacological and kinetic properties of such channels are made difficult because of the barriers for drug access to the cells in the slices, the use of this preparation has the advantage of allowing for the identification of receptor function within its natural environment. Thus, we have investigated the functions mediated by neuronal nAChRs expressed in neurons visualized in hippocampal slices. Hippocampal slices were obtained according to the procedure briefly described (Alkondon et al., 1996b). After sacrificing Sprague-Dawley rats (3- to 30-day-old) under CO2 narcosis, the cerebral hemispheres were removed and placed in cold physiological solution. After dissection, the hippocampi were placed on the stage of a vibrating slicer (FTB, Weinheim, Germany), and 200- to 300-μm transverse slices were cut in ice-cold ACSF solution, which consisted of (in mM): NaCl, 124; NaHCO3, 26; KCl, 3; Na2HPO4, 1.25; CaCl2, 2; MgCl2, 2; and glucose, 10. Slices were incubated in aerated ACSF at 32–35°C for 30 to 60 min and thereafter at room temperature. Visualization of individual neurons in the slices was made possible by the use of infrared microscopy (fig. 15). The surface of the visualized neurons was cleaned by a gentle stream of ACSF to permit ready access of the patch-clamp pipette and the drug-delivery pipette to the cell surface, and agonist was delivered to the neurons by short pulses of positive pressure using a pico-injector (PLI-100; Medical Systems Corp., Greenvale, NY). Under these conditions, application of several nicotinic agonists, including ACh, to pyramidal neurons visualized in the CA1 field of hippocampal slices evoked slowly decaying whole-cell currents that were accompanied by an increased frequency of spontaneous postsynaptic currents (fig. 15). The responses of the neurons to ACh were nicotinic in nature, because they were blocked by d-tubocurarine and were insensitive to blockade by atropine (fig. 15). The nAChR underlying the action of ACh in CA1 neurons is also unlikely to contain the α7 subunit, because MLA is unable to inhibit the ACh-induced responses (Alkondon et al., 1996b). If the nAChR underlying this cholinergic function contains the α7 subunit, this subunit may be combined with other subunits that reduce the apparent potency of MLA in inhibiting the activation of the receptor. In the CA1 field of the hippocampus, it is unlikely that the nAChRs controlling transmitter release are located in the presynaptic terminals, because TTX (200 nM) inhibited the ACh-induced increase in frequency of spontaneous postsynaptic currents, which indicates that depolarization resulting from activation of nAChRs in presynaptic neurons leads to the generation of action potentials that propagate along the neuronal axon and invade the presynaptic terminal causing the release of neurotransmitter. The kinetic and pharmacological analysis of the spontaneous postsynaptic currents whose frequency is increased by nicotinic agonists indicates that those currents are GABAergic; they are blocked by the GABAAreceptor antagonist picrotoxin and have a slow decay phase, characteristic of GABA-mediated spontaneous postsynaptic currents (Alkondon et al., 1996b). Thus, our studies in the slices demonstrate that functional nAChRs are expressed on CA1 hippocampal neurons of GABAergic nature and that depolarization subsequent to the activation of these receptors increases the release of GABA. Characterization of nicotinic responses in neurons visualized in hippocampal slices. Infrared images of rat (P15) CA1 hippocampal neurons in a slice preparation is shown on the left. On the right are the whole-cell currents evoked by ACh and (+)-epibatidine [(+)Epi] in two such neurons. Bath application ofd-tubocurarine (d-TC) abolished the responses elicited by ACh. Holding potential, −50 mV. Our findings contrast with the findings of a recent study on neurons visualized on the CA3 field of hippocampal slices in which evidence was provided that neuronal nAChRs are expressed on presynaptic glutamatergic terminals, and that the activation of these receptors increased the release of glutamate (Gray et al., 1996). Apparently, an α7 nAChR is predominantly found in presynaptic glutamatergic terminals of the CA3 field of the hippocampus, whereby its activation leads to an increase in glutamate release, whereas a functional nAChR, unlikely to bear the α7 subunit, is predominantly expressed on GABAergic neurons in the CA1 field whereby its activation leads to neuronal depolarization that ultimately accounts for GABA release (fig. 16). These findings are in good agreement with the concept that to develop efficacious therapeutic agents capable of balancing the cholinergic function whenever it is impaired, one has to unveil the receptor subtypes involved in the neuronal functions altered in a given pathological condition. Hypothetical model showing modulation of synaptic activity by neuronal nAChRs. Different color codes for the nAChRs represent different receptor subtypes. The nAChR shown on the presynaptic axon represents any α-BGT-insensitive nAChR subtype, whereas the nAChR shown on the postsynaptic neuron represents any nAChR subtype. nAChRs are believed to be intimately involved in learning and memory. The level of expression of neuronal nAChRs is reduced in the brain of patients with Alzheimer’s (Schröder et al., 1989, 1991, 1996), and we and others have provided evidence that functional nAChRs and glutamate receptors are expressed in hippocampal and cortical neurons. Therefore, it is tempting to speculate on ways by which nAChRs may participate in LTP, the best studied model for memory acquisition. LTP is induced rapidly by small bursts of activity, and it is characterized by increased efficacy of neurotransmission. In addition, some forms of LTP, particularly the NMDA-dependent LTP, are consistent with Hebbian learning mechanisms (Hebb, 1949). In NMDA-dependent LTP, the postsynaptic NMDA receptor channel opens in response to presynaptically released glutamate only if the postsynaptic cell is sufficiently depolarized. On activation of the NMDA receptors, Ca++ enters the neurons. Elevation of the intracellular levels of Ca++ can result in activation of intracellular kinases, which modify the postsynaptic receptors increasing their sensitivity to glutamate, and/or in the release of retrograde factors that, diffusing to the presynaptic terminal, can increase transmitter release. Considering the NMDA-dependent LTP, activation of postsynaptic nAChRs, like the activation of AMPA-type glutamate receptors, could provide the level of postsynaptic depolarization that is a prerequisite for NMDA receptor gating by glutamate. Thus, coincidental activation of both a cholinergic and a glutamatergic terminal impinging on the same spine could result in strengthening of synaptic transmission translated as LTP. In the case that the postsynaptic nAChR were of the α7 subtype, activation of this channel could cause a significant elevation of the cytosolic concentrations of Ca++ to the levels necessary for release of retrograde messengers such as arachidonic acid, NO and CO, or for activation of the second messenger cascades known to play a role in the modulation of LTP. Ultimately, given that α7 nAChRs present in presynaptic terminals can control transmitter release from hippocampal neurons, in part because of their high Ca++permeability, and that these receptors can be activated by choline, the hydrolysis product of acetylcholine, it is possible that choline could serve as a retrograde messenger that permits sustained release of neurotransmitter. In this scenario, if we consider a spine that expresses both a cholinergic receptor (upon which synapses a cholinergic terminal) and the NMDA receptor (upon which impinges a glutamatergic terminal bearing the α7 nAChR), coincidental activation of both terminals would result in the release of ACh and glutamate, each of which would activate its own postsynaptic receptor under the proper conditions. Then, hydrolysis of ACh by AChE would generate choline, which by diffusion could reach the α7 nAChR located on the presynaptic glutamatergic terminal leading to a sustained release of glutamate, even after stimulation of the presynaptic neuron was terminated. This could represent a mechanism by which ACh acts within the synapse in which it is released, and choline acts in the same or neighboring synapses. It is noteworthy that the α7 nAChR belongs to the evolutionary oldest group of nAChRs (LeNovere and Changeux, 1995). It appears feasible that originally choline rather than ACh was the natural transmitter for this nAChR and that the evolution to ACh was in part caused by the need to have a “two-step transmitter,” i.e., a rapidly acting, rapidly inactivatable one (ACh) and a more slowly removed one (choline). Interestingly, ACh is the only neurotransmitter known to be rapidly inactivated by a specific enzyme, whereas the action of other neurotransmitters is terminated by transport into neighboring cells or by receptor desensitization. The authors are grateful to the excellent technical assistance of Ms. Mabel A. Zelle, Ms. Barbara Marrow and Mr. Benjamin Cummings. The graphical assistance of Mr. Thomas Jemski from the Illustrative Services of the University of Maryland is also gratefully acknowledged. Send reprint requests to: Edson Xavier Albuquerque, Department of Pharmacology and Experimental Therapeutics, University of Maryland School of Medicine, 655 W. Baltimore St., Baltimore, MD 21201. ↵1 Otto Krayer Award Lecture in Pharmacology and Experimental Therapeutics presented by the recipient, Dr. Edson X. Albuquerque. ↵2 This work was supported in part by National Institutes of Health grant NS25296, Environmental Health Service grant ES05730, U.S. Army Medical Research and Development Command Contracts DAMD17-95-C-5063, FINEP, CNPq and PRONEX (Brazil), and the University of Maryland at Baltimore/Federal University of Rio de Janeiro Molecular Pharmacology Training Program. (1994) Nicotine-induced protection of cultured cortical neurons against N-methyl-D-aspartate receptor-mediated glutamate cytotoxicity. Brain Res. 644:181–187. (1988) Structure-activity relationship of reversible cholinesterase inhibitors: Activation, channel blockade and stereospecificity of the nicotinic acetylcholine receptor-ion channel complex. Brazilian J. Med. Biol. Res. 21:1173–1196. (1995a) Nicotinic receptor function in the mammalian central nervous system. Ann. NY Acad. Sci. 757:48–72. (1995b) Neuronal nicotinic receptors: Function, modulation, and structure. Semin. Neurosci. 7:91–101. (1996) Cholinergic mechanisms: From molecular biology to clinical significance. Prog. Brain Res. 109:111–124. (1992) Blockade of nicotinic currents in hippocampal neurons defines methyllycaconitine as a potent and specific receptor antagonist. Mol. Pharmacol. 41:802–808. (1990) α-Cobratoxin blocks the nicotinic acetylcholine receptor in rat hippocampal neurons. Eur. J. Pharmacol. 191:505–506. (1991) Initial characterization of the nicotinic acetylcholine receptors in rat hippocampal neurons. J. Recept. Res. 11:1001–1021. (1993) Diversity of nicotinic acetylcholine receptors in rat hippocampal neurons: I Pharmacological and functional evidence for distinct structural subtypes. J. Pharmacol. Exp. Ther. 265:1455–1473. (1994) Presence of alpha-bungarotoxin- and methyllycaconitine-sensitive nicotinic acetylcholine receptors in rat olfactory bulb neurons. Neurosci. Lett. 176:152–156. (1995) Diversity of nicotinic receptors in rat hippocampal neurons. III. Agonist actions of the novel alkaloid epibatidine and analysis of type II current. J. Pharmacol. Exp. Ther. 274:771–782. (1996a) Mapping the location of functional nicotinic and γ-aminobutyric acid A receptors on hippocampal neurons. J. Pharmacol. Exp. Ther. 279:1491–1506. (1996b) Characterization of nicotinic acetylcholine receptors in CA1 neurons of rat hippocampal slices. Abstr. Soc. Neurosci. 22:1267. (1994) Diversity of nicotinic acetylcholine receptors in rat hippocampal neurons: II. The rundown and inward rectification of agonist-elicited whole-cell currents and identification of receptor subunits by in situ hybridization studies. J. Pharmacol. Exp. Ther. 271:494–506. (1996c) Diversity of nicotinic acetylcholine receptors in rat brain. V. α-Bungarotoxin-sensitive nicotinic receptors in olfactory bulb neurons and presynaptic modulation of glutamate release. J. Pharmacol. Exp. Ther. 278:1460–1471. (1988) N-methyl-D-aspartate (NMDA) receptors are inactivated by trypsin. Brain Res. 458:147–150. (1994) Epibatidine, a potent analgetic and nicotinic agonist. Mol. Pharmacol. 45:563–569. (1996) Ligand-gated ion channels in acutely dissociated rat hippocampal neurons with long dendrites. Neurosci. Lett. 210:177–180. (1995) α-Bungarotoxin binding sites in hippocampal and cortical cultures: Initial characterisation, colocalisation with α7 subunits and up-regulation by chronic nicotinic treatment. Brain Res. 672:228–236. (1992) Pharmacological properties of the homomeric α7 receptor. Neurosci. Lett. 146:87–90. (1993) Mutations at two distinct sites within the channel domain M2 alter calcium permeability of neuronal α7 nicotinic receptor. Proc. Natl. Acad. Sci. U.S.A. 90:6971–6975. (1996) Diversity of nicotinic acetylcholine receptors in rat hippocampal neurons IV. Regulation by external Ca++ of α-bungarotoxin-sensitive receptor function and rectification induced by internal Mg++. J. Pharmacol. Exp. Ther. 277:432–444. (1995) Human α7 nicotinic acetylcholine receptors responses to novel ligands. Neuropharmacology 34:583–590. (1993) Brief lifetime, fast-inactivating ion channels account for the α-bungarotoxin-sensitive nicotinic response in hippocampal neurons. Neurosci. Lett. 164:137–140. (1995) The α-bungarotoxin-sensitive hippocampal nicotinic acetylcholine receptor has a high calcium permeability. Biophys. J. 68:516–524. (1993) A role for the nicotinic α-bungarotoxin receptor in neurite outgrowth in PC12 cells. Neuroscience 56:441–451. (1991) Pentameric structure and subunit stoichiometry of a neuronal nicotinic acetylcholine receptor. Nature 350:235–238. (1996) The role of dendritic action potentials and Ca2+ influx in the induction of homosynaptic long-term depression in hippocampal CA1 pyramidal neurons. Learn. Memory 3:160–169. (1994) Behavioral effects of nicotinic cholinergic receptor (nAChR) blockade with dihydro-β-erythroidine (DHβE) and methyllycaconitine (MLA). Soc. Neurosci. Abstr. 20:150. (1993) Effects of lobeline, a nicotinic receptor agonist, on learning and memory. Pharmacol. Biochem. Behav. 45:571–576. (1996) In vitro neuroprotective properties of the novel cholinergic channel activator (ChCA), ABT-418. Brain Res. 719:36–44. (1994) α9: An acetylcholine receptor with novel pharmacological properties expressed in rat cochlear hair cells. Cell 79:705–715. (1994) Homomers of α8 and α7 subunits of nicotinic receptors exhibit similar channel but contrasting binding site properties. Mol. Pharmacol. 45:212–220. (1995) Emotional Intelligence. (Bantam Books, New York, NY). (1996) Hippocampal synaptic transmission enhanced by low concentrations of nicotine. Nature 383:713–716. (1995) α-Conotoxins selectively inhibit one of the two acetylcholine binding sites of nicotinic receptors. Mol. Pharmacol. 48:105–111. (1994) Localization of nicotinic cholinergic receptors in rat brain: Autoradiographic studies with [3H]cytisine. Neuroscience 62:929–944. (1985) Cholinergic modulation of memory in rats. Psychopharmacology (Berl.) 87:266–271. (1949) The organization of behavior. (Wiley, New York). (1994) A novel nicotinic agonist facilitates induction of long-term potentiation in the rat hippocampus. Neurosci. Lett. 168:130–134. (1995) Nicotinic responses in acutely dissociated rat hippocampal neurons and the selective blockade of fast-desensitizing nicotinic currents by lead. J. Pharmacol. Exp. Ther. 273:1471–1482. (1992) Equilibrium and kinetic study of glycine action on the N-methyl-d-aspartate receptor in cultured mouse brain neurons. J. Physiol. (Lond.) 455:339–365. (1991) Desensitization is a property of the cholinergic binding region of the nicotinic acetylcholine receptor, not of the receptor-integral ion channel. FEBS Lett. 279:216–218. (1995) Molecular evolution of the nicotinic acetylcholine receptor family: An example of multigene family in excitable cells. J. Mol. Evol. 40:155–172. (1995) Nicotinic acetylcholine receptors. in Ligand- and Voltage-Gated Ion Channels, ed Alan North R. (CRC Press, Boca Raton, FL), pp 153–175. (1996) New approach to drug therapy in Alzheimer’s dementia. Drug Discov. Today 1:53–59. (1987) Permeation and block of NMDA receptor channels by divalent cations in mouse cultured neurones. J. Physiol. (Lond.) 394:501–527. (1995) Agonist and toxin sensitivities of ACh-evoked currents on neurons expressing multiple nicotinic ACh receptor subunits. J. Neurophysiol. 74:1212–1221. (1992) Kinetic properties and regulation of GABAA receptor channels. Ion Channels 3:315–343. (1995) Nicotine enhancement of fast excitatory synaptic transmission in CNS by presynaptic receptors. Science 269:1692–1696. (1994) Effects of anabasein-related analogs on rat brain nicotinic receptor binding and on avoidance behaviors. Drug Dev. Res. 31:127–134. (1991) α-Conotoxins, small peptide probes of nicotinic acetylcholine receptors. Biochemistry 30:9370–9377. (1996) Second agonist site on the nicotinic receptor(nAChR): Effects of proteolytic enzymes and noncompetitive antagonists. Abstr. Soc. Neurosci. 22:1268. (1994) 9-Aminoacridines act at a site different from that for Mg2+ in blockade of the N-methyl-D-aspartate receptor channel. Mol. Pharmacol. 46:151–160. (1984) Magnesium gates glutamate-activated channels in mouse central neurones. Nature 307:462–465. (1991) A second pathway of activation of the Torpedo acetylcholine receptor. Eur. J. Biochem. 200:671–677. (1994) Human α7 acetylcholine receptor: Cloning of the α7 subunit from the SH-SY5Y cell line and determination of pharmacological properties of native receptors and functional α7 homomers expressed in Xenopus oocytes. Mol. Pharmacol. 46:546–554. (1996) α-Conotoxin-ImI: A competitive antagonist at α-bungarotoxin-sensitive neuronal nicotinic receptors in hippocampal neurons. J. Pharmacol. Exp. Ther. 278:1472–1483. (1994) Physostigmine and galanthamine: Probes for a novel binding site on the α4β2 subtype of neuronal nicotinic acetylcholine receptors stably expressed in fibroblast cells. J. Pharmacol. Exp. Ther. 270:768–778. (1993b) A novel agonist binding site on nicotinic acetylcholine receptors. J. Recept. Res. 13:413–436. Pereira, E. F. R., Barbosa, C. T. F., Rocha, E. S., Alkondon, M., Albuquerque, E. X. and Eisenberg, H. M.: Neurons isolated from human neocortex express functional ligand-gated channels. ABSTR. Am. Assoc. Neurol. Surgeons, in press, 1997..
(1993a) Identification and functional characterization of a new agonist site on nicotinic acetylcholine receptors of cultured hippocampal neurons. J. Pharmacol. Exp. Ther. 265:1474–1491. (1988) The neurobiology of learning and memory: Elucidation of the mechanisms of cognitive dysfunction. NeuroToxicology 5:413–428. (1986) Nicotine as a psychoactive drug: Anxiety and pain reduction. Psychopharmacol. Bull. 22:865–869. (1994) Neuronal acetylcholine receptors that bind α-bungarotoxin mediate neurite retraction in a calcium-dependent manner. J. Neurosci. 14:889–896. (1990) Postsynaptic NMDA receptor-mediated calcium accumulation in hippocampal CA1 pyramidal cell dendrites. Nature 345:807–810. (1996) Nicotinic receptors in the development and modulation of CNS synapses. Neuron 16:1077–1085. (1993) Barium permeability of neuronal nicotinic receptor α7 expressed in Xenopus oocytes. Biophys. J. 65:2614–2621. (1993) The diversity of neuronal nicotinic acetylcholine receptors. Annu. Rev. Neurosci. 16:403–443. (1993) The NMDA receptor complex. Fundam. Clin. Pharmacol. 7:389–400. (1996) Agonist responses of neuronal nicotinic acetylcholine receptors are potentiated by a novel class of allosterically acting ligands. Mol. Pharmacol. 49:1–6. (1992) Monoclonal antibodies reveal the cellular localization and expression of cortical nicotinic and muscarinic cholinoceptors in human cerebral cortex. Prog. Histochem. Cytochem. 26:266–270. (1991) Nicotinic cholinoceptive neurons of the frontal cortex are reduced in Alzheimer’s disease. Neurobiol. Aging 12:259–262. (1994) Monoclonal antibodies FK1 and WF6 define two neighboring ligand binding sites on Torpedo acetylcholine receptor α polypeptide. J. Biol. Chem. 269:10407–10416. (1996) Molecular histochemistry of nicotinic receptors in human brain. in Alzheimer Disease. From Molecular Biology to Therapy, eds Becker R., Giacobini E. (Birkhäuser, Boston), pp 269–273. (1989) Immunohisto- and cytochemical localization of cortical nicotinic cholinoceptors in rat and man. Brain Res. 502:287–295. (1993) Molecular cloning, functional properties, and distribution of rat brain α7: A nicotinic cationic channel highly permeable to calcium. J. Neurosci. 13:596–604. (1985) The reversible cholinesterase inhibitor physostigmine has channel-blocking and agonist effects on the acetylcholine receptor-ion channel complex. Mol. Pharmacol. 28:527–538. (1994) Properties of Kv2.1 K+ channels expressed in transfected mammalian cells. J. Biol. Chem. 269:23204–23211. (1995) α3β4 expressed in oocytes do not reproduce the single channel properties of rat superior cervical ganglion nicotinic receptors. Abstr. Soc. Neurosci. 21:71. (1995) Dendritic glutamate receptor channels in rat hippocampal CA3 and CA1 pyramidal neurons. J. Physiol. (Lond.) 482:325–352. (1995) Physostigmine, galanthamine and codeine act as ‘noncompetitive nicotinic receptor agonists’ on clonal rat pheochromocytoma cells. Eur. J. Pharmacol. 290:207–219. (1990) Nicotinic acetylcholine receptor superfamily of ligand-gated ion channels. Biochemistry 29:11009–11023. (1993) Three-dimensional structure of acetylcholinesterase and of its complexes with anticholinesterase drugs. Chem. Biol. Interact. 87:187–197. (1994) Multideterminant role of calcium in hippocampal synaptic plasticity. Hippocampus 4:623–634. (1990) Clustering of L-type Ca2+ channels at the base of major dendrites in hippocampal pyramidal neurons. Nature 347:281–284. Witkop, B.: Stepping Stones–Building Bridges, ed. by E. C. Slater, R. Jaenicke and G. Semenza, Selected Topics in the History of Biochemistry: Personal Recollections. IV. Compr. Biochem.38: 109–162, 1995..
(1993) Protease inhibitors and indolamines selectively inhibit cholinesterases in the histopathologic structures of Alzheimer’s disease. Ann. NY Acad. Sci. 695:65–68. (1993) Nicotinic cholinoceptor-mediated excitatory postsynaptic potentials in rat nucleus ambiguus. Exp. Brain Res. 96:83–88.